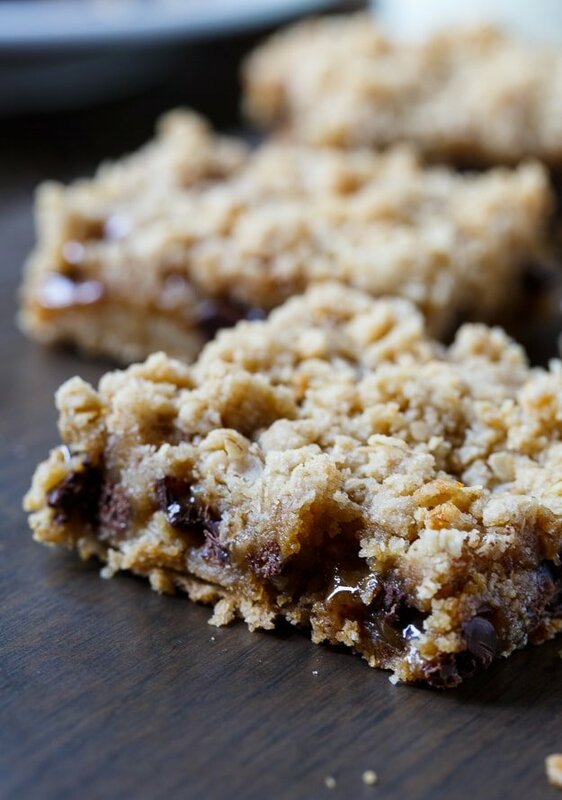 Oatmeal Carmelitas are a super easy to make bar recipe with a gooey caramel and chocolate middle. The crust and the topping are made out of the same mixture of flour, oats, brown sugar, and butter. Half of the mixture is pressed into the bottom of a 9X13-inch pan and baked for 20 minutes. Then a bunch of chocolate chips as well as a whole jar of caramel ice cream topping that is mixed with a little flour for some thickening power is spread on top. Next the remaining oat mixture is sprinkled on top and it is popped back in the oven for about 20 minutes. You really need to let these bars cool completely before cutting them and I suggest refrigerating them. They’ll get a little bit drippy and gooey as they come to room temperature. 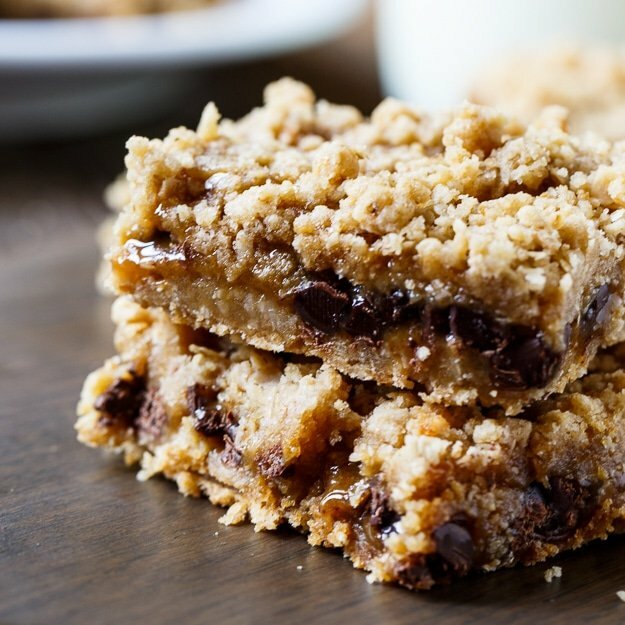 But whether you eat them chilled or at room temperature, these bars are loaded with caramel flavor and it’s hard to stop with just one. I made these to send in a care package to my son at college and thank goodness I had to pack most of them up and seal them in a box or I quite possibly could have eaten all of them myself. Which would have been really bad considering this recipe makes a huge batch of buttery and rich bars. 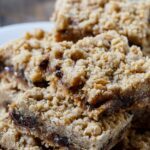 Oatmeal Carmelitas are a super easy to make bar recipe with a gooey caramel and chocolate middle. Place pan in oven and bake for 10 minutes. While crust bakes, whisk together caramel topping and 3 tablespoons of flour in a bowl. 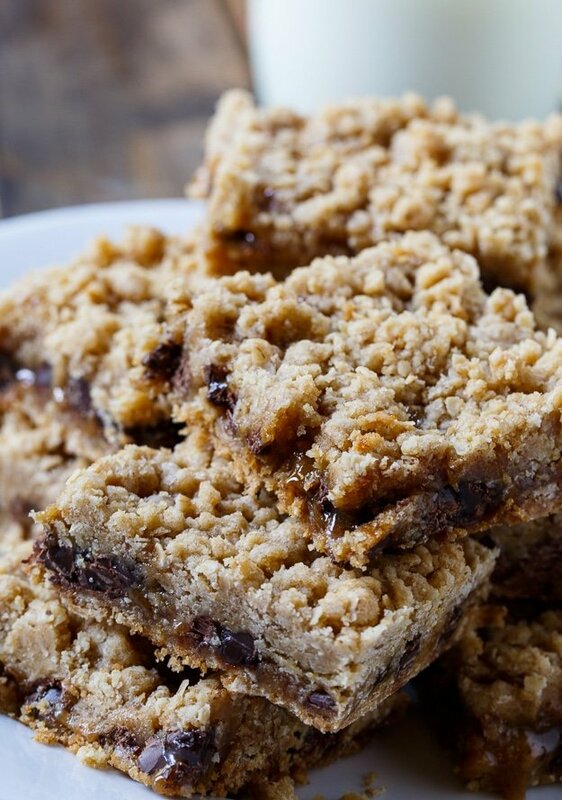 Once crust is done being prebaked, remove it from the oven and sprinkle chocolate chips on top of it. Drizzle caramel mixture evenly over chocolate chips. Sprinkle reserved crumb mixture on top of caramel sauce. Place in 350 degree oven for 20 to 22 minutes, until golden brown. Cool completely and refrigerate for a few hours before slicing. 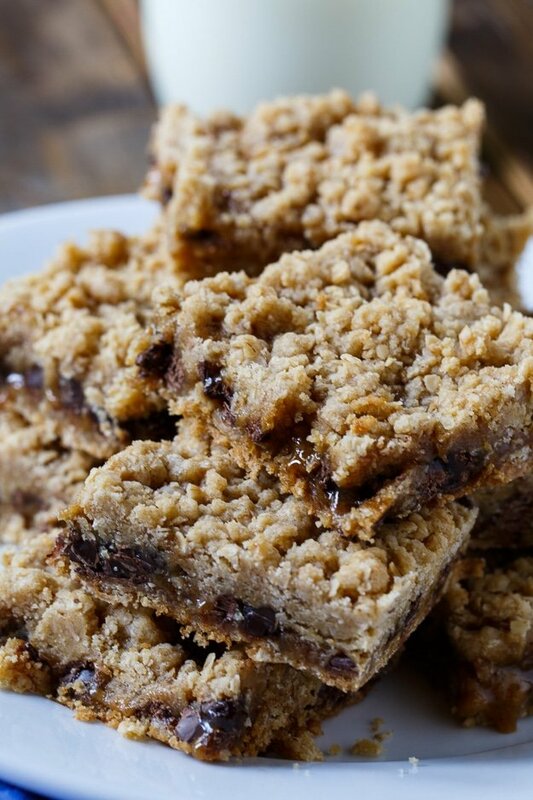 This entry was posted in Brownies and Bars, Desserts. Bookmark the permalink. OMG that gooey caramel and chocolate looks insanely good!! I am hitting that 3pm snacky time right now and just wish I had a piece to devour – love it! Carmelitas are a favorite around here! So rich and gooey! Oh god! 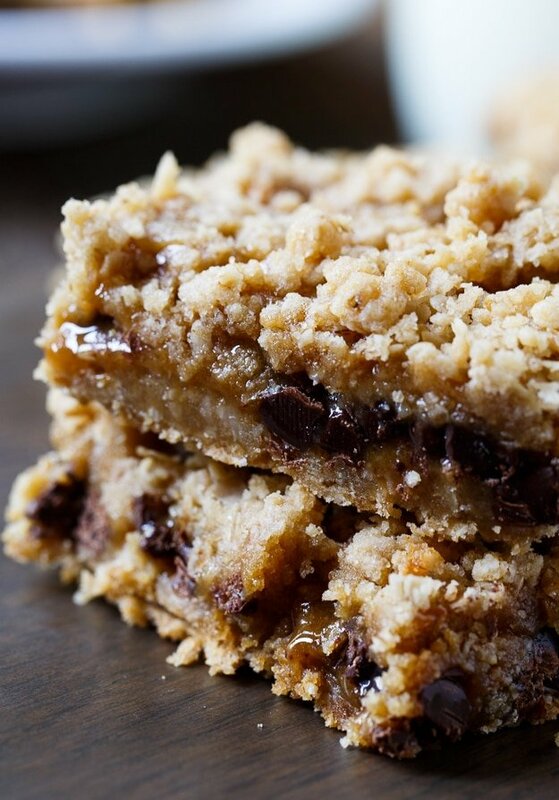 These gooey caramel-y and chocolaty Oatmeal Carmelitas look amazing. Love how and delicious they are! Oh maaaan! I need like ten of these bars in my life asap! I am seriously obsessing over how gooey all that caraeml looks! Gimme!! I feel like I would definitely want to eat wayyy too many of these! They sound sooo good! That topping looks just gorgeous, Christin! I think I could devour this entire batch! Drooling! 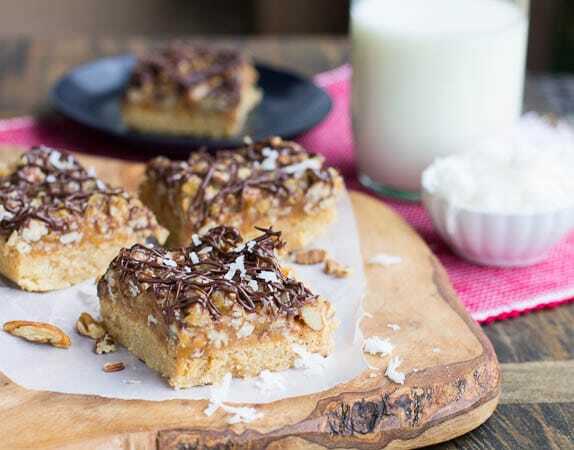 These oatmeal carmelitas look totally next level 🙂 Pinning! OMG these look absolutely sensational. Wow I can’t even stand it!